To Sum It Up: With the recent murder of its prince, unrest stirs in the kingdom of Goredd. Some suspect that a dragon may be responsible, though there’s a peace treaty between humans and dragons. In fact, the anniversary of the treaty approaches, and Seraphina Dombegh, the assistant to the court composer, is busy with preparations for the celebration. She seems an unlikely person to get caught up in court politics, but Seraphina increasingly finds herself involved in attempting to discover whether or not the treaty is about to fall apart, all while she guards her own explosive secret. Review: If I were to describe my feelings for this book in a GIF, the image would show me with a dorky, rapturous grin on my face, bear hugging a copy of Seraphina. Because I loved it that much. It’s epic high fantasy done to perfection—the characters, the medieval style world, the prose, the importance of music, the imaginative take on dragons—every aspect of this book blew me away. I’d never read a book in which dragons featured so prominently, and I thought they were portrayed in a very unique fashion here. They can transform into humans, and their extremely logical minds make them perfectly suited for teaching. The saarantrai, as they’re called, don’t experience emotions like humans do, and they’re not supposed to. Saarantrai who demonstrate too much human-like emotion are punished by having their memories purged. The question of whether or not dragons are capable of feelings like love and hate plays such an important role in the novel, and let me tell you, it certainly yanked on my heartstrings quite a few times. I absolutely loved Seraphina. She’s funny, excels at thinking on her feet, is an outstanding musician, and has the kindest heart. I laughed at how bossy she could be with the musicians she was in charge of, and I felt so sorry for her because the burden of her secret weighed so heavily upon her. Self-preservation forces her to lie often, including to the one person who cannot tolerate anything but the truth: Prince Lucian Kiggs, the Captain of the Queen’s Guard. Kiggs possesses an uncanny knack for knowing things that you never told him, and Seraphina has to tread extra carefully around him. She hates deceiving everyone, especially Kiggs, but revealing the truth about herself would bring unthinkable consequences. There’s quite a large cast of supporting characters, but they’re all given such individual personalities that I had no trouble whatsoever keeping track of them. From Viridius, Seraphina’s cantankerous boss, to Princess Glisselda, Kiggs’s fiancée and Seraphina’s friend who matures a lot throughout the novel, these are some excellently developed characters. But the one who nearly had me in tears the most was Orma, Seraphina’s music teacher and mentor. He’s such an enigmatic figure at first, but the more his character was revealed, the more I admired him. So many of his scenes with Seraphina are so poignant; this book truly wrung my heart. There are so many facets to this novel: Seraphina’s inner struggles, the mystery of who killed Prince Rufus, growing anti-dragon sentiment inflamed by the dangerous Sons of St. Ogdo organization, and plenty of political intrigue. What amazed me was how they all worked in concert, with each component inextricably tied to the others. 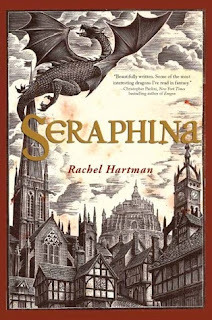 Seraphina is a decent-sized book, yet it never hit a lull, at least for me. I turned the pages at a steady clip, and I can’t think of a single part that could have been shortened or omitted. Oh, and before I forget, this book also contained a good amount of humor! I even chuckled out loud on a handful of occasions. Seraphina was everything that I could ask for in a high fantasy novel, and then some. It became an instant favorite, as well as cemented a place on my list of books that will linger in my mind long after I’ve read them. All in All: I really don’t have anything else to say other than I loved this book immensely! I have passed on this book quite a few times. It took me quite a while to get around to reading this; when I saw a copy at my library, I grabbed it on a whim. I fell in love with the book almost immediately, and I really wanted to kick myself for not picking it up a lot sooner! Haha! She's super lucky to have not one but three dragons! The CGI for them is really impressive, but then again, I pretty much love everything about that show! This book sounds fantastic! I've seen the cover and it looked interesting, but the fact that it has such a great high fantasy story line and great characters I definitely have to check it out! Great review! I absolutely loved the world and how all of the characters had such distinct personalities. I can't wait to read the next book! I keep thinking that I want to read this one! I so wish that I had read this sooner! You should definitely give it a try! I just started reading this! But I keep putting it down not because I don't like it but mostly because I can't seem to concentrate on reading something that isn't light right now. After reading your review I definitely need to pick this up and read it properly! I can't wait to see what you think of this! I found it to be a pretty emotional read (as evidenced by me almost crying a few times, lol), but I laughed quite often, too. This sounds like such a fantastic book! I really think that I would enjoy it. It is already on my to-read list, but I think I'll be looking forward to it much sooner than expected :D Great review! Jaclyn @ JC's Book Haven. This was a real page-turner for me. I especially love fantasy with a medieval feel to it, and this book nailed both elements perfectly. I hope you love it, too! Ooh, I'm excited to hear that you have a copy of this! I really think you'll love it, especially since we're both such big fans of high fantasy! Dragons + medieval world = WIN!